We offer professional quality swimming pool products and supplies that are the best solution for your pool care. Combined with computerized water testing, we are the swimming pool care expert. From chlorine to saltwater pool care products and accessories, you’ll find the right product for your backyard oasis. Shocking your pool water is a needed step for proper pool maintenance. Shocks or oxidizers chemically destroy organic contaminants, remove combined chlorine and help restore water clarity. They are part of the BioGuard® 3-Step Pool Care System. To protect and enjoy your pool, BioGuard recommends the proper maintenance of water balance. These products will maintain balance by adjusting the pH and total alkalinity. They also inhibit or remedy scale and metallic stains from harming pool surfaces. Water enhancers not only get rid of cloudy water and make it brilliantly clear but also help your filter work more efficiently. Cleaning is an important part of pool maintenance. 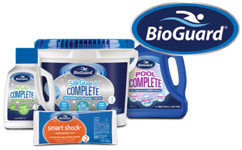 BioGuard products remedy tough stains, improve your water’s sparkle and maintain a clean environment inside and outside of your pool. BioGuard Off Season products are designed to care for your pool during the months when you pool is not being used.